KENNEDY SPACE CENTER, FL – This week SpaceX blasted their first top secret surveillance satellite to orbit for America’s spy chiefs at National Reconnaissance Office (NRO) – affording magnificent viewing and imagery from the Florida Space Coast. Updated with more photos/videos – plus distinctly hear the sonic booms from pad 39A sending birds fleeing! Liftoff of the classified NROL-76 payload for the NRO occurred soon after sunrise Monday morning, May 1, at 7:15 a.m. EDT (1115 GMT), from SpaceX’s seaside Launch Complex 39A on NASA’s Kennedy Space Center in Florida. Less than nine minutes later, Space engineers managed to again recover the 15 story tall first stage booster by accomplishing a precise ground landing by perfectly targeting the vehicle for a propulsive soft landing at Cape Canaveral several miles south of the launch pad. The stunning events were captured by journalists and tourists gathered from around the globe to witness history in the making with their own eyeballs. Check out this expanding gallery of eyepopping photos and videos from several space journalist colleagues and friends and myself – for views you won’t see elsewhere. The milestone SpaceX mission to launch the first satellite in support of US national defense was apparently a complete success. Check out these exquisite videos from a wide variety of vantage points including remote cameras at the pad, Cape Canaveral media viewing site and public viewing locations off base. In this cool video you can distinctly hear the Falcon 9 sonic booms eminating at LZ-1 from pad 39A sending birds fleeing aflutter in fright! NROL-76 marks the fifth SpaceX launch of 2017 and the fourth from pad 39A. The NRO is a joint Department of Defense–Intelligence Community organization responsible for developing, launching, and operating America’s intelligence satellites to meet the national security needs of our nation, according to the NRO. KENNEDY SPACE CENTER, FL – SpaceX today staged the stupendously successful Falcon 9 rocket launch at sunrise of a mysterious spy satellite in support of U.S. national defense for the National Reconnaissance Office (NRO) while simultaneously accomplishing a breathtaking pinpoint land landing of the boosters first stage that could eventually dramatically drive down the high costs of spaceflight. Liftoff of the classified NROL-76 payload for the NRO took place shortly after sunrise this morning, Monday, May 1, at 7:15 a.m. EDT (1115 GMT), from SpaceX’s seaside Launch Complex 39A on NASA’s Kennedy Space Center in Florida. The weather was near perfect and afforded a spectacular sky show for all those who descended on the Florida Space Coast for an up close eyewitness view of the rockets rumbling thunder. The rocket roared off pad 39A after ignition of the nine Merlin 1D first stage engines generated some 1.7 million pounds of thrust. The Falcon sped skyward darting in and out of wispy white clouds and appeared to head in a northeasterly direction from the space coast. “A National Reconnaissance Office (NRO) payload was successfully launched aboard a SpaceX Falcon 9 rocket from Launch Complex 39A (LC-39A), Kennedy Space Center (KSC), Florida, at 7:15 a.m. EDT, on May 1, 2017,” the NRO said in a post launch statement. “Thanks to the SpaceX team for the great ride, and for the terrific teamwork and commitment they demonstrated throughout. They were an integral part of our government/industry team for this mission, and proved themselves to be a great partner,” said Betty Sapp, Director of the National Reconnaissance Office. The launch of the two stage 229 foot tall Falcon 9 was postponed a day after a last moment scrub was suddenly called on Sunday by the launch director at just about T minus 52 seconds due to a sensor issue in the first stage. SpaceX engineers were clearly able to fully resolve the issue in time for today’s second launch attempt of the super secret NROL-76 for the NRO customer. Barely nine minutes after the launch, the 156 foot tall first stage of the SpaceX Falcon 9 rocket made an incredibly precise and thrilling soft touchdown on land at Cape Canaveral Air Force Station’s Landing Zone 1, located a few miles south of launch pad 39A. The quartet of landing legs attached to the base of the first stage deployed only moments before touchdown – as can be seen in my eyewitness photos herein. Multiple sonic booms screamed across the space coast as the 15 story first stage plummeted back to Earth and propulsively slowed down to pass though the sound barrier and safely came to rest fully upright. This counts as SpaceX’s first ever launch of a top secret US surveillance satellite. It also counts as the fourth time SpaceX landed a first stage fully intact on the ground. As is typical for NRO missions, nothing is publically known about the satellite nor has the NRO released any details about this mission in support of national security other than the launch window. Overall SpaceX has now recovered 10 first stages via either land or at sea on an oceangoing platform. NROL-76 marks the fifth SpaceX launch of 2017 and the 33rd flight of a Falcon 9. NROL-76 is the second of five launches slated for the NRO in 2017. The next NRO launch is on schedule for August 14 from Vandenberg Air Force Base (VAFB), California by competitor ULA. Until now launch competitor United Launch Alliance (ULA) and its predecessors have held a virtual monopoly on the US military’s most critical satellite launches. Watch for Ken’s continuing onsite launch reports direct from the Kennedy Space Center and Cape Canaveral Air Force Station in Florida. Liftoff of the still mysterious NROL-76 classified payload for the National Reconnaissance Office, or NRO, is slated Sunday morning, April 30 from SpaceX’s seaside Launch Complex 39A on NASA’s Kennedy Space Center in Florida. The Falcon 9 rocket and NROL-76 payload have been mated and rolled about a quarter mile up the ramp at pad 39A. The 229-foot-tall (70-meter) Falcon 9/NROL-76 were raised erect this morning, Saturday, April 29 and are poised for liftoff and undergoing final prelaunch preparations. The breakfast time launch window on Sunday, April 30 opens at 7 a.m. EDT (1100 GMT). It extends for two hours until 9.a.m. EDT. The exact time of the spy satellite launch within the two hour window is classified at less than T Minus one day. Spectators have been gathering from across the globe to witness the exciting launch and landing and area hotels are filling up. A brand new Falcon 9 is being used for the launch unlike the recycled rocket utilized for the prior launch of the SES-10 mission involving history’s first reflown orbit class booster. As is typical for NRO missions, nothing is publicly known about the satellite nor has the NRO released any details about this mission in support of national security other than the launch window. We also know that this is the first launch of a spy satellite for the US governments super secret NRO spy agency by SpaceX and a source of pride for Musk and all SpaceX employees. However you can watch the launch live on a SpaceX dedicated webcast starting about 20 minutes prior to the 7:00 am EDT opening of the window. As is customary for all national security launches live coverage of the launch will cease approximately five minutes after liftoff as the secret payload makes it way to orbit. However, SpaceX will continue their live webcast with complete coverage of the ground landing attempt back at the Cape which is a secondary objective of the launch. Everything is on track for Sunday’s launch of the 229 foot tall SpaceX Falcon 9 on the NRO launch of NROL-76. And the weather looks promising at this time. Sunday’s weather outlook is currently forecasting an 80% chance of favorable conditions at launch time. The concerns are for cumulus clouds according to Air Force meteorologists with the 45th Space Wing at Patrick Air Force Base. In case of a scrub for any reason on April 30, the backup launch opportunity Monday, May 1. The path to launch was paved following a successful static hotfire test of the first stage booster on pad 39A which took place shortly after 3 p.m. Tuesday, April 25, as I reported here. 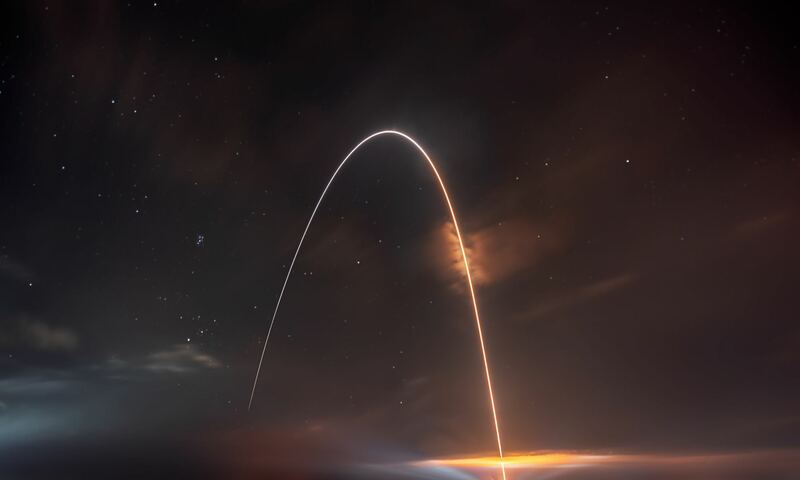 Until now launch competitor United Launch Alliance (ULA) and its predecessors have held a virtual monoploy on the US military’s most critical satellite launches. The last first stage booster during the SES-10 launch of the first recycled rocket landed on a droneship barge at sea last month. SpaceX will also attempt to achieve the secondary mission goal of landing the 156 foot tall first stage of the Falcon 9 rocket on land at Cape Canaveral Air Force Station’s Landing Zone 1, located a few miles south of launch pad 39A. This counts as the fourth time SpaceX will attempt a dramatic land landing potentially visible to hundreds of thousands of locals and tourists. NROL-76 will be the fifth SpaceX launch of 2017. MERRITT ISLAND NATIONAL WILDLIFE REFUGE, FL – Elon Musk’s SpaceX is primed for another significant space first; the firms first launch of a spy satellite for the US governments super secret spy agency; the National Reconnaissance Office, or NRO – following today’s successful static hotfire test of the Falcon 9 launchers first stage booster. Tuesday’s hotfire test to took place shortly after 3 p.m. this afternoon, April 25, at SpaceX’s seaside Launch Complex 39A at NASA’s Kennedy Space Center in Florida. The successful test paves the path for launch of the NROL-76 classified payload for the NRO atop a SpaceX Falcon 9 rocket this Sunday morning, April 30 from pad 39A. “Static fire test complete,” SpaceX confirmed via social media just minutes after finishing the brief test at 3:02 p.m. EDT (1902 GMT). The engine test is conducted using only the first two stages of the rocket – minus the expensive payload in case anything goes wrong as like occurred during the catastrophic AMOS-6 static fire disaster last September. The test is routinely done so that SpaceX engineers can confirm the readiness of the rocket and all its systems to safely and successfully launch the specified payload to its intended orbit. Furthermore this launch is also notable because it features the next land landing by a SpaceX Falcon 9 first booster back at the Cape for only the fourth time in history – which also makes for an extremely thrilling experience – and unforgettable space enthusiasts event. So by all means try to witness this launch from the Florida Space Coast in person, if at all possible. The breakfast time launch window on Sunday, April 30 opens at 7 a.m. EDT. It extends for two hours until 9.a.m. EDT. The long range weather outlook currently looks favorable with lots of sun and little rain. But that can change on a moment’s notice in the sunshine state. The brief engine test lasting approximately three seconds took place at 3:02 p.m. today, Tuesday, April 25, with the sudden eruption of smoke and ash rushing out the flame trench to the north and into the air over historic pad 39A on NASA’s Kennedy Space Center during a picture perfect sunny afternoon – as I witnessed from the Merritt Island National Wildlife Refuge in Titusville, FL. During today’s static fire test, the rocket’s first and second stages are fueled with densified liquid oxygen and RP-1 propellants like an actual launch, and a simulated countdown is carried out to the point of a brief engine ignition with the rocket firmly clamped down and held in place. This is only the fourth Falcon 9 static fire test ever conducted on Pad 39A. Following the engine test, the propellants are drained and the rocket is rolled off the pad and back into the huge SpaceX processing hanger at the pad perimeter. The NROL-76 classified surveillance satellite will be bolted on top. The rocket will be rolled back to pad 39A in advance of Sunday’s planned blastoff.